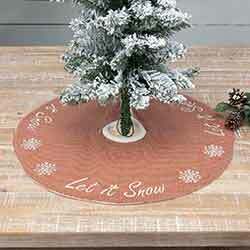 Apple red and almond accentuate the traditionally designed Let It Snow 48 inch Tree Skirt. 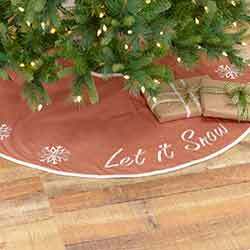 Apple red and almond accentuate the traditionally designed Let It Snow 21 inch Mini Tree Skirt. 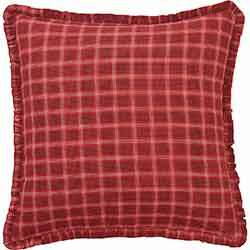 Apple red and almond micro-houndstooth accentuate the traditionally designed Let It Snow Pillow 14x18. Let It Snow is prominently displayed in the middle, surrounded by festive snowflakes. 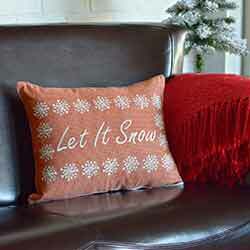 The Red Burlap Pillow Let It Snow 16x16 matches the desire for white and picturesque scenery. 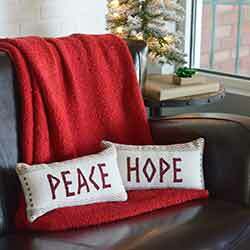 The pillow is a soft and vibrant red cotton burlap with silver stenciling and finished with silver pom-pom trimming. 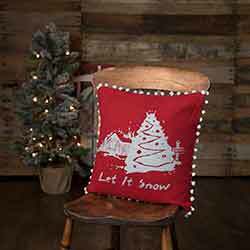 Memories of decorating gingerbread men, piping sugar cookies, and making holiday crafts inspired us to create the Let Your Heart Merry Little Christmas Pillow Set. The primitive inspired Americana red, black, and white large-scale plaid of the Liberty Stars Fabric Euro Sham adds a subtle flair to the bedroom. The Liberty Stars Flag Jute Placemat Set wears its heart on its sleeve. 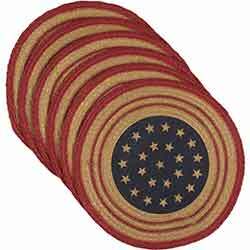 The Liberty Stars Flag Braided Round Placemat Set wears its heart on its sleeve. 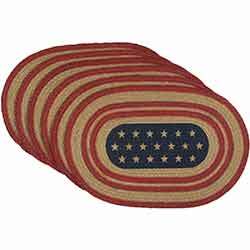 Welcome guests with a patriotic flare with the Liberty Stars Flag Braided Half Circle Rug. 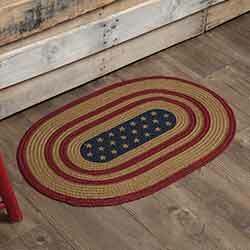 The indigo star stencil in the center is surrounded by concentric braids of solid Americana red and almond jute for a truly primitive patriotic look. 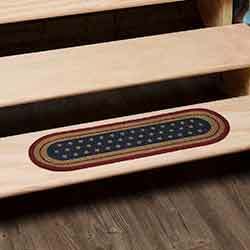 The Liberty Stars Flag Jute Stair Tread features an indigo star stencil in the center, surrounded by concentric braids of solid Americana red and almond jute for a truly primitive Americana look. 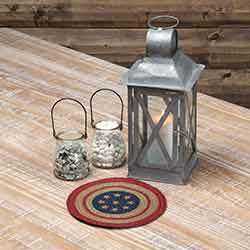 Set a patriotic table with the 36 inch Liberty Stars Flag Braided Table Runner. Indigo star stenciling is surrounded by concentric braids of solid Americana red and almond jute for a truly primitive look. 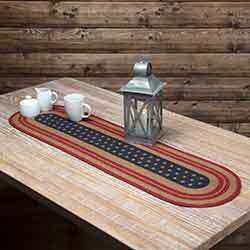 Set a patriotic table with the 48 inch Liberty Stars Flag Braided Table Runner. Indigo star stenciling is surrounded by concentric braids of solid Americana red and almond jute for a truly primitive look. The Liberty Stars Flag Braided Trivet wears its heart on its sleeve. The indigo star stencil in the center is surrounded by concentric braids of solid Americana red and almond jute for a truly primitive patriotic look. 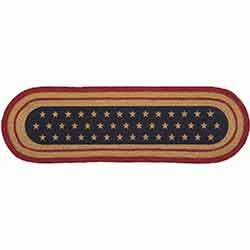 Welcome guests with a patriotic flare with the Liberty Stars Flag Braided Oval Rug. 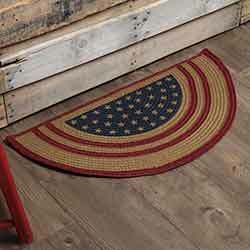 The indigo star stencil in the center is surrounded by concentric braids of solid Americana red and almond jute for a truly primitive patriotic look. 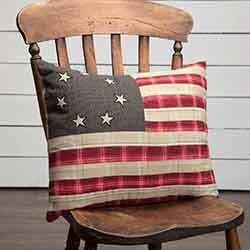 The Liberty Stars Flag Pillow gets its inspiration from the Betsy Ross American flag lending to its primitive origin. Presented in Americana red, navy, and khaki. Complete the look of your bed with the Liberty Stars Bed Skirt. Featuring navy and white check cotton. This is for the King size. 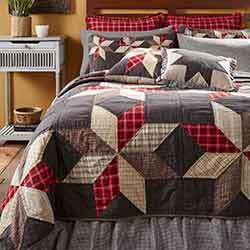 The mainstay of the hand-quilted Liberty Stars Quilt is the oversized Americana red, navy, khaki plaid and check eight-point stars with geometric shapes over a dark micro check base. This is for the King size. 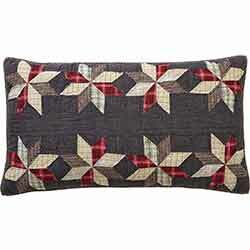 The mainstay of the Liberty Stars Luxury Sham is the oversized Americana red, navy, khaki plaid and check eight-point stars with geometric shapes over a dark micro check base. 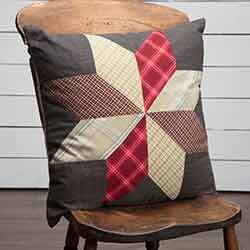 The mainstay of the hand-quilted Liberty Stars Quilt is the oversized Americana red, navy, khaki plaid and check eight-point stars with geometric shapes over a dark micro check base. This is for the Luxury King size. 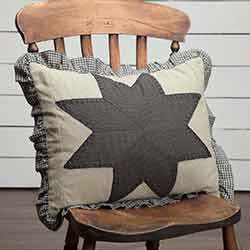 The Liberty Stars Patchwork Throw Pillow begins with a soft greige chambray base over which is a dark navy plaid appliqued Ohio Star in its center. 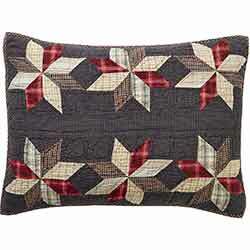 The Liberty Stars 18 inch Patchwork Throw Pillow features a large, multi-plaid Ohio Star patch in its center on a dark navy micro check base for an Americana primitive look. Complete the look of your bed with the Liberty Stars Bed Skirt. Featuring navy and white check cotton. This is for the Queen size. 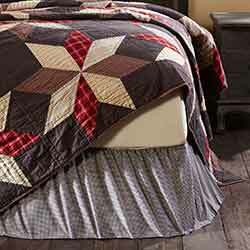 The mainstay of the hand-quilted Liberty Stars Quilt is the oversized Americana red, navy, khaki plaid and check eight-point stars with geometric shapes over a dark micro check base. 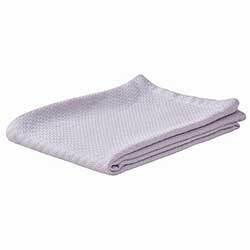 This is for the Queen size. 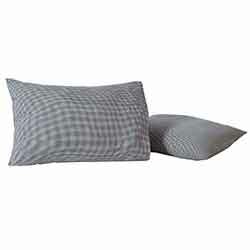 Accent your primitive bedroom decor with the Liberty Stars Pillow Case Set with its all-cotton simple navy and white check. The mainstay of the Liberty Stars Standard Sham is the oversized Americana red, navy, khaki plaid and check eight-point stars with geometric shapes over a dark micro check base. Complete the look of your bed with the Liberty Stars Bed Skirt. Featuring navy and white check cotton. This is for the Twin size. The mainstay of the hand-quilted Liberty Stars Quilt is the oversized Americana red, navy, khaki plaid and check eight-point stars with geometric shapes over a dark micro check base. This is for the Twin size. 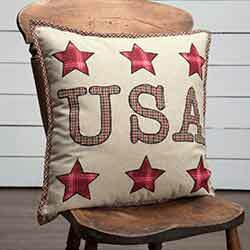 The Liberty Stars USA Applique Trow Pillow proudly displays a patriotic center with "USA" appliqued in Americana red, black, and khaki plaid. Experience fresh Nordic inspiration this Christmas morning with the Liv 15 inch Stocking. 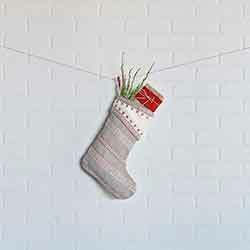 The stocking features a pebble grey canvas with slanted rows of crimson and creme Nordic trim. Experience fresh Nordic inspiration this Christmas morning with the Liv 20 inch Stocking. 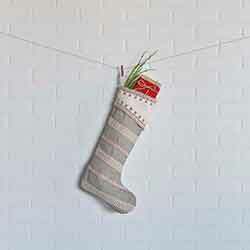 The stocking features a pebble grey canvas with slanted rows of crimson and creme Nordic trim. 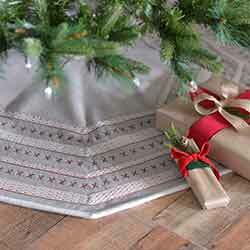 Experience fresh Nordic inspiration this Christmas with the octagon Liv 48 inch Tree Skirt. The skirt is a beautiful pebble grey canvas with alternating rows of Nordic trim and primitive stitching. 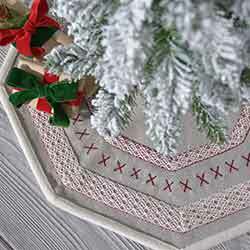 Experience fresh Nordic inspiration this Christmas with the octagon Liv Mini 21 inch Tree Skirt. The skirt is a beautiful pebble grey canvas with alternating rows of Nordic trim and primitive stitching. Reverses to creme felt. Experience fresh Nordic inspiration this Christmas with the filled Liv Pillow Set of 2 7x13. 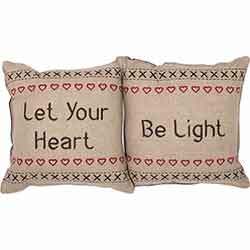 Love You More Decorative Pillow, by VHC Brands. 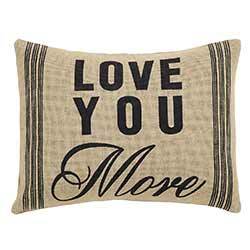 Send a message of love to your special someone with this decorative pillow, proclaiming "Love You More" offset with pinstripes in black stencil on soft natural shade cotton burlap. Reverses to cotton burlap with 2 wooden buttons. Luna Gabby, part of the Bella Taylor line by VHC Brands. Luna Hobo, part of the Bella Taylor line by VHC Brands. Luna Metro Crossbody, part of the Bella Taylor line by VHC Brands. Luna Signature Zip Wallet, part of the Bella Taylor line by VHC Brands. Luna Wristlet Pouch, part of the Bella Taylor line by VHC Brands.